(PhysOrg.com) -- The Kilobots are coming. Computer scientists and engineers at Harvard University have developed and licensed technology that will make it easy to test collective algorithms on hundreds, or even thousands, of tiny robots. Called Kilobots, the quarter-sized bug-like devices scuttle around on three toothpick-like legs, interacting and coordinating their own behavior as a team. 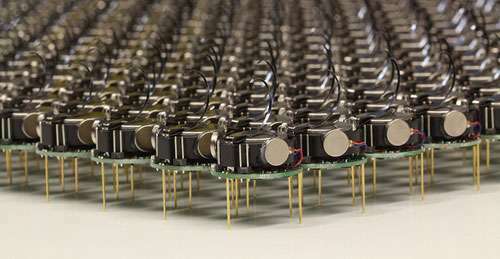 A June 2011 Harvard Technical Report demonstrated a collective of 25 machines implementing swarming behaviors such as foraging, formation control, and synchronization. Once up and running, the machines are fully autonomous, meaning there is no need for a human to control their actions. The communicative critters were created by members of the Self-Organizing Systems Research Group led by Radhika Nagpal, the Thomas D. Cabot Associate Professor of Computer Science at the Harvard School of Engineering and Applied Sciences (SEAS) and a Core Faculty Member at the Wyss Institute for Biologically Inspired Engineering at Harvard. Her team also includes Michael Rubenstein, a postdoctoral fellow at SEAS; and Christian Ahler, a fellow of SEAS and the Wyss Institute. Thanks to a technology licensing deal with the K-Team Corporation, a Swiss manufacturer of high-quality mobile robots, researchers and robotics enthusiasts alike can now take command of their own swarm. One key to achieving high-value applications for multi-robot systems in the future is the development of sophisticated algorithms that can coordinate the actions of tens to thousands of robots. "The Kilobot will provide researchers with an important new tool for understanding how to design and build large, distributed, functional systems," says Michael Mitzenmacher, Area Dean for Computer Science at SEAS. "Plus," he adds, "tiny robots are really cool!" The name "Kilobot" does not refer to anything nefarious; rather, it describes the researchers' goal of quickly and inexpensively creating a collective of a thousand bots. Inspired by nature, such swarms resemble social insects, such as ants and bees, that can efficiently search for and find food sources in large, complex environments, collectively transport large objects, and coordinate the building of nests and other structures. Due to reasons of time, cost, and simplicity, the algorithms being developed today in research labs are only validated in computer simulation or using a few dozen robots at most. In contrast, the design by Nagpal's team allows a single user to easily oversee the operation of a large Kilobot collective, including programming, powering on, and charging all robots, all of which would be difficult (if not impossible) using existing robotic systems. So, what can you do with a thousand tiny little bots? Robot swarms might one day tunnel through rubble to find survivors, monitor the environment and remove contaminants, and self-assemble to form support structures in collapsed buildings. They could also be deployed to autonomously perform construction in dangerous environments, to assist with pollination of crops, or to conduct search and rescue operations. For now, the Kilobots are designed to provide scientists with a physical testbed for advancing the understanding of collective behavior and realizing its potential to deliver solutions for a wide range of challenges. Obligatory "I, for one" comment anyone? Awesome to finally see this idea put into practice though. instead of making herkyjerky stiltbots from scratch.., I would think if one is trying to test robot swarms, having higher mobility would be key. Because these guys can run for 3 hrs on a single watch battery. Just remember people, out of the who-knows-how-many thousands of projects being done at any given period of time; some of them being cute and some being frightening for various reasons (magnetic propelled kinetic ordinance freak anyone else out?) all it takes is one "Skynet" to end the world, and someone is working on it. @Cave Man, If everyone had your world view, we would all be still living in caves and dying before we reach our 30s. "Skynet", whenever I see a comment with that word in it, I know nothing insightful will be found there. Great. Soon I can have the nanite cloud synthetic organelle symbiosis in my cells. I wont need a computer or a cellphone anymore. I just use my mind connected to my nanite cloud. It could also do tissue repair and medicine delivery, biosensors and i dont know what else. Today, the nanite cloud. Tomorrow, the world! The innovation here is a physical representation, but essentially, it's just a cellular automata system. Emergent behaviors from cellular automata run as computer simulations have been explored extensively over many years. The complexity of such behaviors from very simple rules never fails to amaze. Reminds me of that "robot" in development awhile back that supposedly travels around battlefields and the like consuming "organic waste" (read: corpses) to burn as a source of "fuel" or energy. "I, for one" comment is now considered a 'pointless verbiage' by PhysOrg. In case of invasion the overlords won't be merciful to the staff of this server. True, lol. And, of all they're categories for "post removal", I can't quite figure out how they can make that determination. Seems like there's LOTS of pointless verbiage. But they don't take it all off. Can you program them to vote?